Oval carabiners are a true technological breakthrough. Because of its shape, the load is shared equally between the spine and gate sides of the carabiner, which typically results in lower strength ratings. However, with our exclusive ISO Cold Forging process, we are able to compensate by shifting material and putting aluminum where it needs to be to reinforce the frame. 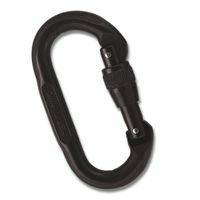 Compare for yourself and you’ll see that we have one of the strongest oval carabiners on the market. At 22kN, it’s 4kN higher than other ovals, which means that our oval is an oval you can rely on for everyday, all-around use. Our TACTICAL carabiners are anodized with a flat/non-reflective finish. The anodizing is intentionally dull, and not shiny in order to reduce glare. It's a minor detail, but it definitely helps conceal your hardware compared to common, brightly polished gear.